Predating his debut full-length, For the Sake of the Song (AKA First Album) by two years, In the Beginning is a posthumous recording that captures the early genius of Townes Van Zandt as he experiences his first Nashville recording session. And though the songs are only demos, In the Beginning plays as an unreleased album, a collection of work that play well together, not like a bunch of demo'd songs thrown together. From the opening couplet of "I got a black widow for a mama, Lord/ I got a Diamond Back Rattler for a Pa," with its bluesy-garage rhythm section. To the country-tingled "Waitin' for the Day". And through the bluesy "Black Jack Mama", Van Zandt is spot on, his tender, lonesome voice carrying the songs and their characters through ups and downs as they struggle to find their existence. Even in 1966, pre-Van Zandt's proper introduction with For the Sake of the Song, he shows his natural gift and sheer genius, recording a flawless set of songs that withstand the test of time and hint at the greatness that was to come. 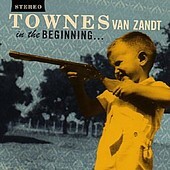 In the Beginning stands up well with any of Van Zandt's other work when put into perspective. I'll give it an A.